in San Antonio during the holidays. San Antonio loves to show off its fancy decorations during the holidays, and there is much to enjoy in the Alamo city at this special time of year. The Holiday River Parade and Lighting Ceremony has been a cherished tradition for more than 27 years and is one of the most highly-anticipated events of the year. It’s something you’ll remember for many years. 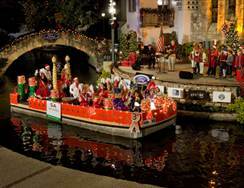 On November 25th, 150,000 parade-goers along San Antonio’s River Walk will be treated to illuminated floats, live music, and lots of holiday cheer. At 7:00 p.m., 1.4 million LED lights will illuminate, officially ushering in the winter holiday season and casting a brilliant glow over the entire River Walk. The twinkling lights are on display through New Year’s Day, so visitors to the Riverwalk will be able to enjoy the festive atmosphere throughout the holidays. River Walk even more festive. 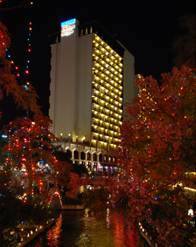 New this year - San Antonio’s most iconic hotel, Hilton Palacio del Rio, is offering 2 special packages for residents and visitors alike to join in this merry tradition. Hilton Palacio del Rio is the only hotel located along the River Walk with private balconies in every room – perfect for viewing the lights from above. Two warm fleece blankets to keep warm during parade. Information and photos provided by Jaclyn Slifer, Murphy O’Brien Public Relations.